Netanyahu thanks the United States for its friendship with Israel but also for “making the world a much better place”. 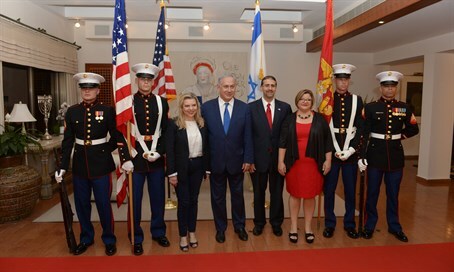 Prime Minister Binyamin Netanyahu on Thursday evening thanked the United States for its friendship with Israel and for its military support as well, but also for “making the world a much better place”. Netanyahu's comments were made at a Fourth of July event at U.S. Ambassador Daniel Shapiro's residence. Netanyahu began his remarks by mentioning the terrorist attack in Kiryat Arba, in which Hallel Yaffa Ariel, a citizen of the United States, was murdered. "This night of celebrations comes after a day of tragedy. In Kiryat Arba, near Hevron, the city of our forefathers, young Hallel Yaffa Ariel, a 13 year old, was murdered lying in her bunk bed,” he said. “What makes someone slit the throat of a child? It’s not the quest for peace. It’s the mind flooded with hate and incitement, an ideology that says this child is not a human being,” continued Netanyahu. “We will always fight the terrorists. We will fight their despatchers; we will fight the inciters; we will fight the sponsors. You do battle with terrorism by fighting the terrorists and those who back them,” he vowed. “This is our position, this is the American position. And I repeat it here on this day, the Fourth of July, which also commemorates the fortieth anniversary of the rescue at Entebbe, in which we fought terrorism and we received much support,” said Netanyahu. “And I want to use this opportunity as we celebrate the Fourth of July to thank President Obama, Vice President Biden, Secretary Kerry, with whom I just spent a fruitful day in Rome, to reaffirm again that our greatest alliance, our most basic alliance is with the United States of America,” stated Netanyahu. “Today, the United States and the Jewish state serve as beacons of progress and hope for people around the world. Both Israel and America respect individual rights. We respect individual rights while we cherish our collective identities. The two are intertwined,” the Prime Minister continued. “When America is denigrated by some abroad, I want each and every one of you to know that Israel stands with America, shoulder to shoulder, through thick and thin. We are here for you as you are here for us,” concluded Netanyahu.